The DP9800 Series thermometer can be used in conjunction with a PC to provide accurate, versatile 8 channel thermocouple and Pt100 RTD temperature measurements, scanning and logging of measured values. 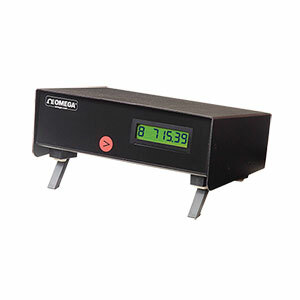 It can also be used as a “stand alone” indicator/ logger and incorporates a digital backlit LCD display of measured temperature. The built-in self-calibration facility for the DP9800-TC thermocouple model is a rapid and convenient method for on-site calibration and does not require any additional equipment other than a special, external link. Self-calibration of Pt100 ranges is equally simple and uses plug-in precision resistors. The DP9800 is designed to provide exceptional stability with high measurement resolution and represents an ideal crossover between plant practicality and laboratory performance at a very competitive price.The PC software supplied with the instrument allows control, measure and calibration functions. Note: all inputs are non-isolated and thermocouples must be ungrounded style. Nota: Comes complete with power adaptor, USB cable, software and operator’s manual (on CD).